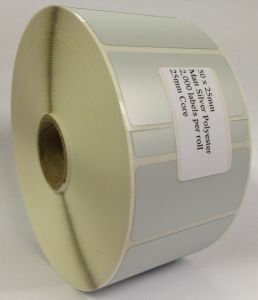 2,000 50 x 25mm matt silver polyester labels with an hitack adhesive. Polyester labels are suitable for labelling durable goods, equipment identification purposes, rating / name plates and barcode labels. Suitable for exterior and interior applications that require high resistance to scuffing / abrasion, water and solvents.